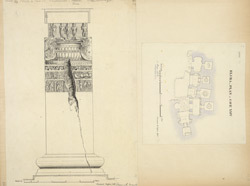 Illustration of a pillar from cave XXV (left) and plan of cave XXIV (right) from James Burgess' 'Original Drawings [of] Elura Cave Temples Brahmanical and Jaina, IIII.' The spectacular site of Ellora, in Maharashtra, is famous for its series of Buddhist, Hindu and Jain cave temples excavated into the rocky façade of a cliff of basalt. The works were carried out under the patronage of the Kalachuri, the Chalukya and the Rashtrakuta dynasties between the sixth and the ninth centuries. Illustration of a pillar from Cave XXV, Kumbarwada on left. ? [This] is a drawing of the side of one of these pillars, showing how the bracket is separated from the capital of the shaft by a neck narrower than the shaft itself, and illustrating at the same time the deterioration in style and taste which the proportions and details indicate." Illustrated on right is the plan of Cave XXIV, a Hindu temple at Ellora. Cave XXIV, consists of a series of shrines and six round vedis in the Hindu temple.